I think most of us have recordings in our possession that we’re embarrassed about. I was going through my modest collection recently and found a few shockingly awful CD’s. In a short-sighted move that may permanently damage my career in the music business, I’m going to share some of these abominations with y’all in the coming weeks. Why do some great players do stupid things? Take Sir James, “The Man with the Golden Flute”. He’s a virtuoso flute player, a legend who has performed with practically all of the world’s great orchestras. He also appears to be a musician of questionable taste. I don’t have a problem with cross-over artists if there is some measure of artistic integrity in what they’re doing. I imagine it can feel constricting after years of performing the same narrowly-defined repertoire, so it’s understandable if a musician wants to pursue an interesting project in a different genre. Some of Jimmy’s choices, however, seem to be driven by pure commercial greed. 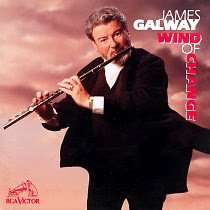 Take Wind of Change, his truly craptacular recording of pop songs. Backed by a few synths and a drum machine, Sir James performs hits such as Tears in Heaven, I Just Called to Say I Love You, and Holding Back the Years. When the elevator takes you down to Hell, this is the music you’ll be hearing. Anyway, you’re probably wondering why I bought this huge hunk of cheese. The truth is, I didn’t buy it. I was surprised to find it in my possession, and then tried to blame B for bringing this evil into our house. I mean, just imagine the permanent damage it could inflict on our kids if they accidentally heard his version of When a Man Loves a Woman. It turns out the disc came from my dad’s collection. I’ve come to grips with this by convincing myself that Columbia House sent it to him by accident and he never got the chance to send it back. One can hope. I had 3 Yanni CDs. I think that I bought one of them (hate to admit that) but then, for some reason, my friends thought that I couldn’t live without a couple more. They are no longer in my possession. Funny, I really can live without Yanni.